WASHINGTON: The United States has credible information that Russia and Syria are trying to “sanitise” the site of a suspected chemical weapons attack in Syria while denying access to the area by international inspectors, the State Department said on Thursday. Department spokeswoman Heather Nauert said the team of inspectors from the Organisation for the Prohibition of Chemical Weapons (OPCW) had not been given access to the site of the alleged attack in the town of Douma on April 7. “We have credible information that indicates that Russian officials are working with the Syrian regime to deny and to delay these inspectors from gaining access to Douma,” Nauert told a news briefing. 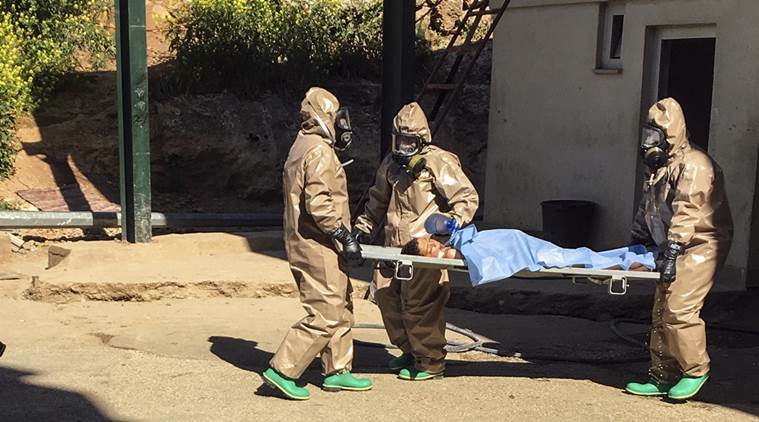 “Russian officials have worked with the Syrian regime, we believe, to sanitise the locations of the suspected attacks and remove incriminating evidence of chemical weapons use,” she added. Western countries say scores of people were gassed to death in the attack. Russia and its ally deny that. A UN security team came under fire in Syria on Wednesday while doing reconnaissance for inspectors to visit the sites of the suspected attack. The United States, Britain and France fired missiles at Syrian targets on Saturday in retaliation for the suspected chemical use. Nauert said the United States worried that the evidence would “deteriorate” the longer the inspectors were delayed. “That is of great concern to us,” she said.